Lightweight Stereo Headphones in Yellow. 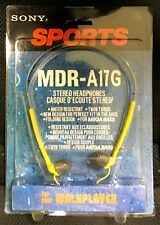 Sony Sports Dynamic Stereo Headphones MDR-W10 Walkman Discman Yellow Gray . Condition is Used. Shipped with USPS First Class Package. Sony headphones Vintage Plug In Walkman. Condition is Used. Shipped with USPS First Class Package. Sony Sports MDR-A17 Folding Headphones. Minor wear from use. Condition is Used. Good luck 👍. These Sony headphones have been tested and sound good. The pads can be used, but have a few tears starting on the sides. 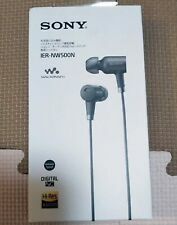 Sony Walkman Lightweight Acoustic Turbo Stereo Headphones New In Package. Condition is New. Shipped with USPS First Class Package. Tested working- See photos for details. VINTAGE Sony Walkman MDR-027 Adjustable Head Ear Phones WITH ORIGINAL PADS. Condition is Used and they sound great. Please ask any questions or request more pictures to become an informed purchaser. The seller takes no responsibility in the purchaser not being satisfied with the product. If this is shipped with first class and you would like insurance you must request it and message me prior to payment for the auction. Shipped with USPS First Class Package. SONY Acoustic Turbo Circuit for enhanced sound quality. may occur. Mass: Approx. 63 g (2.2 oz) without cord. Frequency response: 16-20,000 Hz. Tested & fully functional. In excellent physical condition. Lightly & gently used. Ear pads are in very good condition. Vintage Sony TRH-1 Stereo Headphones 3.5mm For Walkman VERY GOOD USED SMOKE FREE COSMETIC CONDITION! SOME SLIGHT DISCOLORING ON THE EARPADS! CLEANED & SANITIZED TESTED FUNCTIONS PERFECTLY! PLEASE REFER TO ALL PHOTO'S AND JUDGE FOR YOURSELF! 30 DAY HASSLE FREE RETURN POLICY! FREE SHIPPING WITH TRACKING! PAYMENT DUE IN 2 DAYS! VINTAGE Sony Walkman MDR-027 Black Adjustable Headphones W/pads Tested WORK. Condition is Used. Shipped with USPS First Class Package. If you have a portable cassette or CD player in the 1990s, you most likely used this model. • Not only do these headphones feel and sound great, but they display beautifully. W alkman Lightweight Headphones. SONY Walkman In Ear Headphones MDR-W14 TESTED & WORKING - Yellow Gray. Condition is Used. Few minor signs of wear, good overall. Tested working great. Model: MDR- 010. • Headphones are 100% clean and sterilized even though they have never been used. Headphones have been tested and are in working condition. D ynamic Stereo Ultra Lightweight Headphones. GENUINE SONY PRODUCT. Stereo Earbuds Headphones For CD Player,MP3,iPod,Radio. Significantly extended bass as well as slightly brighter treble. Plug: 3.5mm Gold-plated straight plug. 2.65 ft to where the left & right side splits. 1 out of 5 stars - Sony Stereo Earbuds Headphones BASS For Walkman,CD Player,MP3,iPod,iPad,Radio..
1 product rating1 product ratings - Sony Stereo Earbuds Headphones BASS For Walkman,CD Player,MP3,iPod,iPad,Radio.. MISSING EAR PADS. Headphones are fully functional with EXCELLENT quality sound. Zero corrosion. Includes manual. Vintage Sony Original Stereo Walkman Headphones - MDR-101LP - New, sealed package. WHAT YOU SEE IN THE PICTURES IT IS WHAT YOU GET. Featuring Sony Acoustic Turbo Circuit for high quality sound reproduction. Sony walkman with sony walkman headphones. The Walkman and headphones are tested and working perfectly. New ListingVintage Sony Walkman Headphones “RARE” WORKING TESTED! Classic Over-ears Style! Vintage Sony Walkman Headphones “RARE” WORKING TESTED! Classic Over-ears Style!. Condition is Used. Shipped with USPS First Class Package. Amazing headphones this is the first Style can’t find them in this style I mail very fast! 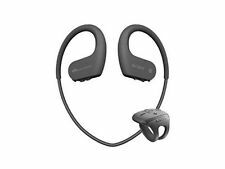 NEW Sony Walkman MDR-G42LP Headphones Behind Neck Lightweight MDR-G42. Condition is New. Shipped with USPS First Class Package. Extremely hard to find, Sony MDR-W11 Stereo Headphones Twin Turbo ULTRA RARE Walkman Discman. Tested and they work great. Condition is Used. Shipped with USPS. SONY MDR-023 Original Walkman Headphones. PLUS Bonus Walkman Belt Clip Carry Case. 1998 ORIGINAL SONY STEREO HEADPHONES FOR WALKMAN! ORIGINAL SONY STEREO HEADPHONES FOR WALKMAN! HARD TO FIND HEADPHONES! GENUINE SONY! DATED 1998. 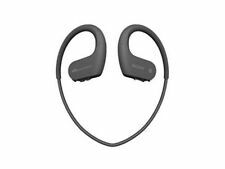 Sony Sport MDR-W14 Walkman Headphones / Earbuds. This item is being sold "As Is". This item is sold "as is". Vintage Sony Walkman Headphones MDR-25. Item has been fully tested sounds and works excellent. Cosmetically the item is used but in great condition does have a few light scratches from normal use but all very minor foam ear pads are in great condition. 4 best condition and description of item please see all pictures prior to purchasing. Item will be shipped USPS first class mail free of charge. Up for sale is a Sony Walkman headphones. Headphones are new and still in package.If you have any questions about this item please leave me a message thank you and have a great day. Please take a second to look at my eBay for other great items thank you. The batteries and speaker pods are not included. Deep, major, detailed cleaning is NOT done unless noted above. This is a used item and will have signs of use. In the 1980s, Sony released Walkman headphones so that consumers could enjoy music without disturbing others. If you want to listen to current music tracks through vintage headphones designed by Sony, these headphones are worth considering. On eBay, you can find affordable Sony Walkman headphones in a variety of colors so that you can easily pick a product that matches your style. What features are included with Sony Walkman headphones? An adjustable headband: This feature can help you find an ideal level of comfort while wearing Sony Walkman headphones. The adjustable mechanism has several notches that make the headband longer or shorter. Extra bass: While playing tracks with bass notes, Sony's extra bass hardware can intensity bass notes. The technology makes bass notes deeper as they move through both speakers. Folding capabilities: This is a storage feature that can come in handy when you travel. The folding mechanism is found on the main housing. Noise-cancellation hardware: Noise-cancellation blocks surrounding sounds. It also makes the process of hearing quiet music tracks easier. Stereo sound: Stereo sound is a standard Sony Walkman feature. Since all headphones have two speakers, every unit produces stereo sound. 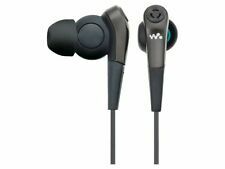 What are the main earpiece designs for Sony Walkman headphones? Canal earbuds: These earpieces mount in the ear canal. They stay secure throughout the most demanding sports routines. Earbuds: Sony Walkman earbuds mount in the ear outside of the canal. When compared to canal buds, these pieces have more mobility around the canal. Ear-cup: Ear-cup pieces mount over the ear. The cup design is large and comfortable. Ear-pad: Ear-pad pieces also rest over the earlobe. These earpieces have plush, comfortable padding. What are the fit options for Sony Walkman headphones? What devices have a port for Sony Walkman headphones?